Shoppers in Gallowtree Gate, in the centre of Leicester, should never find themselves short of cash. Within a five minute walk they can find no fewer than 68 cash machines, or Automated Teller Machines (ATMs) as they are more properly known. Including machines inside the banks themselves, there are 41 within a minute of each other, the highest concentration of ATMs in the UK. The proliferation of ATMs costs banks a fortune, as they typically have to pay 25p for each transaction an account holder makes, a sum known as the interchange fee. But more than that, the issue of ATMs has become the subject of a furious dispute, with allegations of profiteering, deception, and even delusion. The industry is accusing Link - which manages the ATM network - of trying to close down tens of thousands of machines. Link says it is merely trying to preserve ATMs in remote areas, while removing unnecessary machines in places such as Leicester. As shown in the chart above, the number of free-to-use ATMs in the UK has grown rapidly over the past decade, to 55,000. Running the machines has proved highly attractive to independent operators, who run as many ATMs as the banks. Cardtronics, a US firm, made pre-tax profits of £46m in the UK last year, while Notemachine made £14.7m. "When I look at the country, what I see is a very rapid increase in city centre ATM numbers, which is not doing anybody any good, except possibly making money for ATM operators," said John Howells, the chief executive of Link. Shoppers in Leicester seem to agree. "There's probably not the need for as many as there are now, so to reduce them down, that probably wouldn't be a bad thing," said Paula Derbyshire. "We don't need them all." Independent operators - and banks other than your own - receive 25p from your bank each time you withdraw cash. Link believes it can reduce the incentive to put ATMs in city centres, by gradually cutting that fee, over a five year period, to 20p. But that idea has been met by a stream of vocal objections from the operators themselves. Ron Delnevo, the executive director of the ATM Industry Association (ATMIA), has accused Link of concocting a plan to make cash less accessible. "We're going to grumble, we're going to shout, we're going to scream, and we're going to blow their ivory towers down," he told the BBC. "While I've still got breath, this will not happen." To locate your nearest cash machine, click here. ATMIA estimates that tens of thousands of ATMs could be removed, including the loss of machines in bank branches which are due to close. However, Link says the total number of free-to-use ATMs will only fall by 5% over the next two years - as a result of lower interchange fees. That implies some 2,750 fewer machines. Earlier this week one of the operators, Cardtronics, said it was already planning to close some of its ATMs, as a direct result of plans to reduce the interchange fee. However, it would not confirm whether most of the threatened machines were in pubs and clubs, where lower usage reduces profit margins. If Link goes ahead with its proposal, Cardtronics said the free-to-use ATM model in the UK would become "unsustainable", while there would be "large ATM deserts around the UK, mostly in the already under-served rural communities and small towns and villages". As part of a Financial Inclusion Programme (FIP), some 400 remote ATMs are already protected by an extra subsidy, to try to make such ATMs more attractive for operators. So on top of the existing interchange fee of 25p, operators are paid an extra 10p per transaction. One such machine is in a convenience store in Loughborough, where the nearest other free ATM is over 1km away. "The next nearest machine is on Leicester Road, which is more than 15 minutes walk," said shop-keeper Minal Modhavidiya. "Many people rely on this machine in the shop, because it's free." Link admits that the existing subsidy is inadequate. It is planning to increase the subsidy on FIP machines from 10p to 30p. So operators in such areas would receive 50p per transaction (20p + 30p), instead of the 35p they receive now (25p + 10p). The number of ATMs in the FIP would also be increased to cover some 1,700 "communities". In addition, Link also announced this week that any free-to-use ATM that is more than 1km from the next nearest one will continue to receive the full 25p interchange fee. These may be significant concessions, but operators are still not happy. A spokesperson for Cardtronics called the idea "a notional drop in the ocean", which wouldn't make any difference. The company accused Link of "delusion". 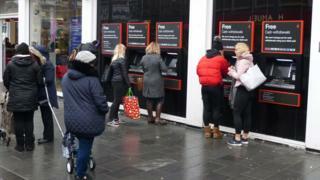 ATMIA called the move a "kneejerk U-turn", which would "still leave the vast majority of UK ATMs uneconomic." It called for an investigation by the Payments System Regulator. In turn, Link has accused the operators of defending their own interests, rather than the public's. "I do believe a lot of what has been put in the press by a small number of large operators is more about positioning -and protecting - their commercial position, than the need to close machines," said John Howells. And he remains adamant that the forthcoming proposals - which will take effect in April - will benefit those who do not live in city centres where there is a plethora of ATMs. "What I want to make sure is that every town, every village, every city, every High Street - they've all got one very effective functioning ATM, which is free," he said. "Even if we have to have a painful debate, it's a debate that has to be had, because access to cash is too important to lose."